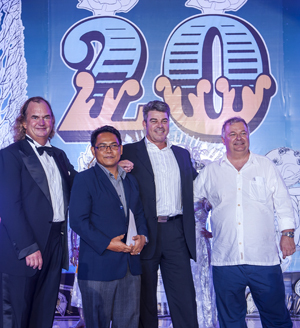 Timeshare owners who are members of The Karma Royal Group will know that the leading luxury timeshare specialists recently celebrated their 20th anniversary in style, with parties across various resorts in Asia. Staff and VIP guests were flown in from across the globe for the celebrations, with the Bali extravaganza taking place at the glamorous Hong Kong Gardens in Sanur which last well into the early hours of the morning. Meanwhile, more than 900 guests enjoyed a ballroom bash for the Indian celebrations, which were held at the Radisson Blu hotel in Goa. Guests were treated to a sit down meal and free drinks, including unique cocktails created specially for the occasion by well-known Greek mixologist Yianni Giannopoulos. Karma specialises in creating especially memorable experiences at its designer resorts in unique locations, with a focus on spa and wellness breaks. Weddings and special events can also be held at the resorts – for more information and to view the select portfolio of special places to stay, see www.karmaresorts.com. The party night in Goa also featured a presentation by Karma Royal Group’s chairman and CEO John Spence, as well as plenty of music and a number of selected awards to recognise staff achievements. Rishi Verma, at RCI India, said: ““We are very proud that John launched what is now a leading and greatly respected international luxury hospitality brand from a beach shack office here in Goa with RCI.